For the latest news on hangar 11 Collection please visit our Facebook page, where we are updating almost daily. The Hangar 11 Collection had another really busy year in 2015, arguably the highest profile period since we started back in 1999. 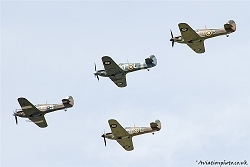 Our collection of the four greatest allied fighter aircraft of the 1930s and1940s comprise the iconic Supermarine Spitfire, Hawker Hurricane, North American P-51 Mustang and Curtis P-40 Kittyhawk. These were the four preeminent fighters of that era and each are rare and unique in their own right, with huge wartime history and provenance. 2015 was the 70th anniversary of the end of WW2 and also 75 years after the Battle of Britain, so our MK XI Spitfire and MK IIB Hurricane were especially in demand. 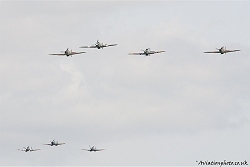 We were involved in several large formations of period fighters, most notably at Fairford (Royal International Air Tattoo) as well as at Biggin Hill and at Goodwood and on each occasion the crowds were just huge to honour the aircraft that contributed to the end of those dark years. Air shows form a key part of our activities and this year was no exception, with Hangar 11 Collection travelling to many of the biggest air shows in the UK as well as Europe. These included displays at as far apart as Holland and Northern Ireland, major shows such as Sunderland, Dunsfold, Biggin Hill, Southport, RAF Cosford, RN Culdrose, Yorkshire Airshow and so many more. You may be surprised to know that air shows are the second largest spectator sport in the UK after football! Another significant part of our flying activities surrounds corporate events, private parties, weddings and sadly even funerals. We had the pleasure to fly at a private event for Sir Richard Branson, weddings for several happy couples (such a joy to be involved with!) plus displays special concert events in recent years such as Castle Howard in Yorkshire, Leeds castle , Warwick Castle , Dover castle and more. Running a fleet of rare fighter aircraft from WW2 involves a very high level of commitment and organisation as there are so many challenges in this endeavour. Parts are clearly an issue, as most are obviously exhausted and have to be sourced from all corners of the globe from specialist companies and enthusiasts. Engine and system parts are the biggest issue as these are now 75-80 years old since original manufacture. Newly manufactured parts for RR Merlin engines for instance cannot be utilised as this is prohibited by the UK authorities (CAA) who are very strict in this area. Also, the expert skills required to run a collection like ours are hard to find and we have to pay tribute to our engineering team led by Chris Norris, together with our fantastic team of dedicated volunteers, led by Steve Atkin and Alec Kinane. As we enter the winter season two of our aircraft are in airworthy condition and can be seen over the skies in SE England, whilst the P51 Mustang and Hurricane are now in deep maintenance, being prepared for our next busy season in 2016. Hangar 11 Collection are one of the most active and experienced organisations running WW2 fighters with almost 20 years’ experience of the UK and European airshow arena, plus private parties, weddings and corporate events. Plus of course private experience flights which can be arranged in our US Fighters. Supermarine Spitfire Mk IX PT879 will be the latest addition to the Hangar 11 Collection. We are all pretty excited about her, as she will be the very first Spitfire to return from Russia, having been consigned as part of the wartime “Lend Lease” process to 2nd squadron , 767th Regiment, 122nd Division of the Russian Airforce. She left the Supermarine factory at Castle Bromwich on 4th August 1944 and was shipped via Murmansk to her Russian squadron. She crashed during a dogfight in Spring 1945 with just 29 hours on the airframe and was recovered by a capitalist/socialist farmer who must have realised her value in time. Returning to the UK by a circuitous route in the early 1990’s , we acquired her in 2001. A complete although crashed aircraft, we have the fuselage, large parts of the wings, engine, parts of the hub and prop, this lot fill a 20 foot container ! A huge numberof original parts will be used in the restoration, some 600 already utilised in the airframe alone from the actual aircraft. Progress is excellent and being undertaken by Airframe Assemblies on the Isle of Wight. We expect the fuselage to arrive at North Weald early next year, to commence her fit out, this will include electrics, hydraulics, pneumatics, instrumentation. 90% of the systems in a Spitfire are in the fuselage. 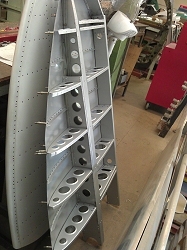 Her wings will be overhauled in the meantime, again using hundreds of original parts from the aircraft itself.Presentation and colour scheme will be as accurate as all our other aircraft, especially considering we have the original wings and fuselage at Hangar 11 as the prime reference!! 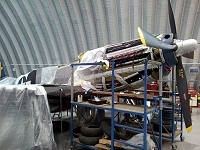 She will be brilliant, a very special restoration and addition to the Hangar 11 Collection! The last few weeks have been somewhat frustrating in terms of the lack of flying time, as a consequence of the weather having been so poor. We had floods, then fog and then snow and freezing conditions. However our P51 Mustang " Jumpin Jacques" was flying all through that period, whenever a small window in the weather appeared, if only for local trip to keep engine, electrics and airframe in good shape, we did get her out whenever we could. The odd trip away from base was also achieved, to Turweston, Kemble, Wellesbourne and Sleap but flying hours have been limited. Anyway, at this time of year activity at the Hangar 11 Collection is fast and furious, as we take the opportunity to get the aircraft into their best possible working order for the busy season ahead. 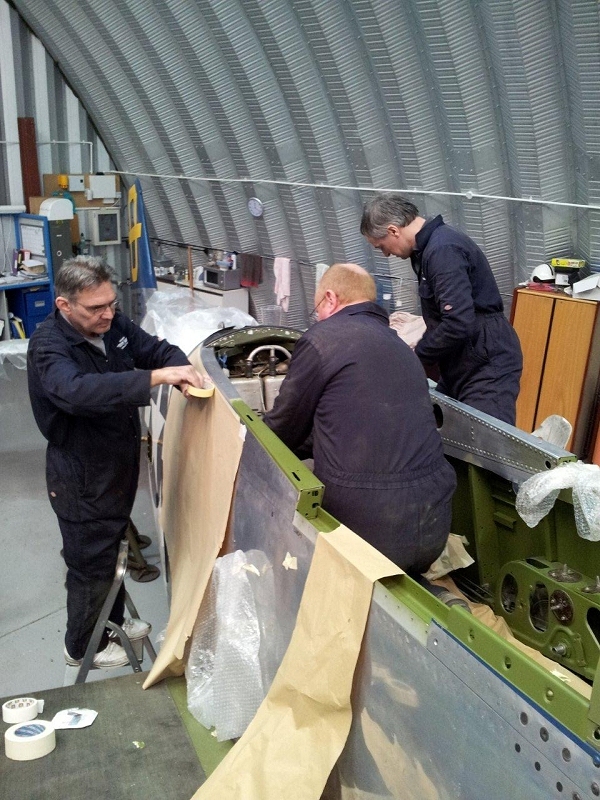 That involves not only ongoing servicing by our brilliant chief engineer Chris Norris and his assistant Simon but constant improvement of the aircraft through a schedule of restorations each year. Winter 2011/2012 saw a complete refurbishment of the P51 Mustang cockpit interior, returning her to " as new" 1944 condition in every detail. 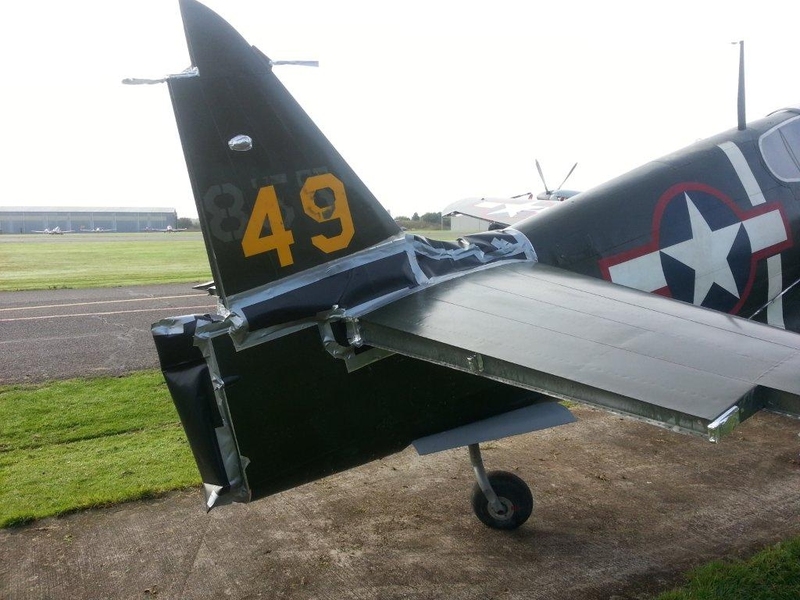 Now winter 2012/2013 involves our rare P40 Curtiss Kittyhawk, which is enjoying a bare metal re-spray to appear for the new season in a completely new colour scheme, never seen in the UK or Europe before. A bare metal re-spray is a pretty involved task, as we discovered, removing over 30 years of accumulated paint from the old lady. She wore 4 different schemes, one under the other as previous owners had taken the cheaper, less painful route to just flatten back the old paint and spray over. The result has been a really tough few months of paint stripper and hard elbow grease as we remove that accumulated paint from every nook and cranny but wow, it has been a long road. Almost 6 months work, pretty much all by our volunteer team who worked weekends since October on her. However their efforts will result in a fabulous paint job when she emerges in April for her first engagements. The volunteer team comprises these dear old mates; Steve Atkin , the Kinane brothers Alec and James, Keith "Rodders" Rodwell, Steve Eley, Captain Phil Ansell and Mick the quiet one. I owe each of these guys a debt of thanks and will surely repay during the summer with flights, long airshow weekends with much beer and just being close to these wonderful old aircraft, which in itself offers so much satisfaction. So the P40 will have new paint and also some restoration work to her cockpit area. 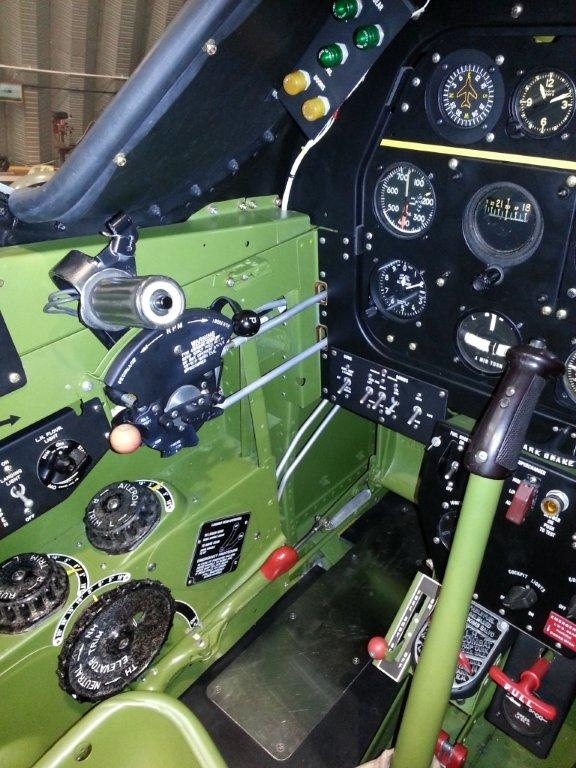 That may not be completely finished this winter but well on the way, as we have banished any 1980s avionics and associated wiring to the bin and replaced with the correct versions. She is a wonderfully original aircraft, Chris Norris says that " she hardly has one rivet that was not fitted in the Curtiss factory in 1943" Moving onto other information, as I mentioned earlier "Jumpin Jacques" is in fine fettle. Currently we are re-fitting some original oxygen equipment, both gauges, hoses and oxygen regulator. She will be due her annual inspection in the season, so we need to juggle hours and engagements so as not to disappoint any of our airshow clients during July. PL 965 our unique MK XI Spitfire has been in a rest period since first week December. She's having a well earned break after a really busy 2012 season. She will be back in the air in March/ April, again she has a busy season ahead with many airshow commitments, private functions and of course weddings Such a pleasure for us to fly these occasions as we get close to the bride and groom and become a big part of their special day and help to make it so memorable by flying a fabulous display. Do take a look at our testimonial section for comments by happy couples.why not get married and let us fly for you. it's worth it! Our Hurribomber BE505 is mid annual inspection in readiness for a packed season with some long distance displays. The pick of the bunch is a 1000 mile flight deep into Germany ( where few Hurricanes ever went in wartime due their limited fuel range) to attend the Old Timers Airshow in September. This is our fourth trip in different aircraft from the collection and we just love the German crowds who are so appreciative of these fine Allied fighters and the fact that they come a long way for their enjoyment. We normally schedule the trip in 2 legs, stopping in Belgium en route to re-fuel. Trip has been done in one day though but either way a real adventure in what is basically a short range fighter. Always a hoot when asked by German ATC " what is your type" and then often a silence follows.wonder why! The other interesting news has been our arrival into the Facebook era. For that we have to thanks Christine Yates who dragged us there kicking and screaming but hey, we love it and have built up a strong following in just 4 weeks. Our "LIKES" are just shy of 800 and seems we are going viral.whatever that means! Anyway, whilst this website is a great medium to shop window the collection and have extensive albums of photos, I have to say that Facebook is a fully interactive medium that allows us to really stay close to our supporters, announce displays and special events and post videos and photos of up to the minute events. Do take a look, tick the "Likes" flag. The page is; https://www.facebook.com/Hangar11Collection and you can just click on this link to visit it. Every year about this time, we get many requests to publish our airshow schedule but it is frankly rather too early to do that as so many events still to firm up their line ups. As you may be aware, the RAF allocates display assets such as the Red Arrows, BBMF, Typhoon and so on and a fine job they do too. As these guys are heavily subsidised by you and I the tax payer, they are always first on the hit list for airshows and we smaller guys have to wait for the RAF allocations committee to make their minds up who gets what assets. That process is supposed to be concluded each year by Xmas but in reality, they do not issue the detailed list until March 1st ( bless ) That means that we have not got a clear picture at all of where we will be displaying, although we have many dates firm, we prefer to get into April before issuing any schedules. 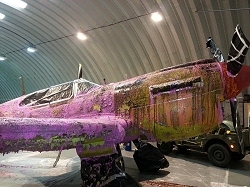 Hope you have enjoyed this news article, I will add some photos of the Kittyhawk during her paint adventures. All will be worth it later in the year! I started the last news piece with an apology and here am doing so again. As I mentioned at the time, the year had been a tough one for me personally, what with weather challenges, the economy and the Olympic restrictions but the biggest one was my mother who was very ill all year. Very sadly, she passed away on 10th August so that had a deep impact. I thank all our supporters for their kind messages. Well, it has been a strange year but as I sit back at season end, all in all we got through it pretty well. We covered most of the biggest shows, aircraft reliability was good and we pushed through the weather wherever possible and at the end, all toys are safely back in the box! I cannot recall that we had one “no show” we were right where we were supposed to be and had super reviews for our displays, plus so many great images to remember the season by. I have to thank so many “snappers” who year after year capture some fabulous images of our aircraft at displays around the country. Too many to name but Darren Harbar, Phil Makanna, Lance Kuhn are a few that come to mind, thanks guys. In addition a big thank you to our excellent team of engineers led by Chris Norris and Simon. In addition our super volunteers without whom we would not be able to run the collection quite so smoothly and also, be hard to turn out such pristine aircraft week on week. Great job Steve, Alec, “Rodders”, Steve 2, Phil and James. The season has had many “highs” as each season always does. This year I displayed at many of my favourite shows and they were all fun but you know, you can’t beat a wedding, often held at idyllic locations such as Leeds Castle or one wonderful wedding on the Isle of Sheppey, surrounded by desolate marsh land, brilliant fun over the estuary and the feedback from the bride and groom really make it worthwhile. We are adding some testimonials to the site over next days and do read them, the ones post wedding are always a joy and make the job really worthwhile! We now move into our winter maintenance phase, a quieter time for me as Chief pilot but full on for Chris Norris our chief engineer and his team. As those of you who follow us will know, very few warbirds fly year round, except ours! We fly every week of the year that the conditions will allow, as planes that stand around are far the worse for it, they need to be flown regularly. This winter, you may well see “Jumpin Jacques” our P51 Mustang and PL 965 our MK XI Spitfire in the skies near you. Onto specifics, we are now finally stripping the film paint off the P40, didn’t we do well nursing it for a full 3 seasons! 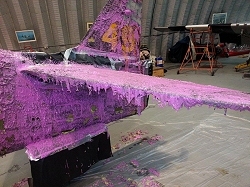 I will attach some photos but we have now removed here control surfaces ( rudder, elevator, ailerons) and she is well on to being fully masked for stripping. We hope to have her in bare metal by mid November and ready for paint in January. The new colour scheme is a closely guarded secret, if I told you…. I would have to kill you. What I will say is that she will be painted in unique colour scheme, not seen before since wartime as far as I am aware. As well as paint, G-KITT will have mechanical works carried out, to include her Annual inspection and some other improvements. We never settle for less than perfection and are always striving to achieve that. “Kitty” will look fabulous for the 2013 season, still a very rare Warbird with just 2 other examples in Europe after all. Our Hurribomber had a busy season and was displayed at many major shows and corporate events throughout the country. She had very few mechanical snags, barring a loss of hydraulic fluid in the port olio which meant that I had to “abandon” her at Headcorn in August but that aside great trouble free year. I say it again but the Hurricane may be the poor relation to her more illustrious cousin the Spitfire but man oh man, she’s a lovely plane to fly, such a regal old lady which handles so crisply and will out turn a Spitfire any day. The Hurribomber is now off line and will start her annual inspection in the spring. “Jumpin Jacques” what a transformation she has undergone, I pinch myself each time I fly her. Please see some of the photos on the site but you will never see a more accurate and original Mustang anywhere in the world. Considering that she has such an extensive wartime history with the 332nd Fighter group of the USAF ( Tuskegee airmen) in Italy during 1944/1945, then 13 years in other squadrons stateside, then no major restorations since those war years, she is a very special and historically significant aircraft. 44-72035 “ Jumpin Jacques” had really busy season, having displayed as far north as Edinburgh and Sunderland and East Fortune and as far south the big seaside shows, such as Eastbourne, Dunsfold and Shoreham, with all stops in between. In my opinion, the P51 is at a different level in terms of her capabilities as compared to the other fighters. Yes there will always be a heated debate about which was the greatest fighter of WW2 and both Spitfire and Mustang often seem to be battling for top spot. However, as a person perhaps better qualified than most to give an opinion ( well over 1000 flights between the 2 types) I have to say that the Mustang is well ahead. It should however be remembered that the P51was developed in the USA ,in factories not being bombed day and night and a full 8 years after the Spitfire, so eons in terms of wartime development. We are now concluding a number of outstanding jobs on the Mustang, which we had to shelve in the summer as she needed to get back into the air pronto. 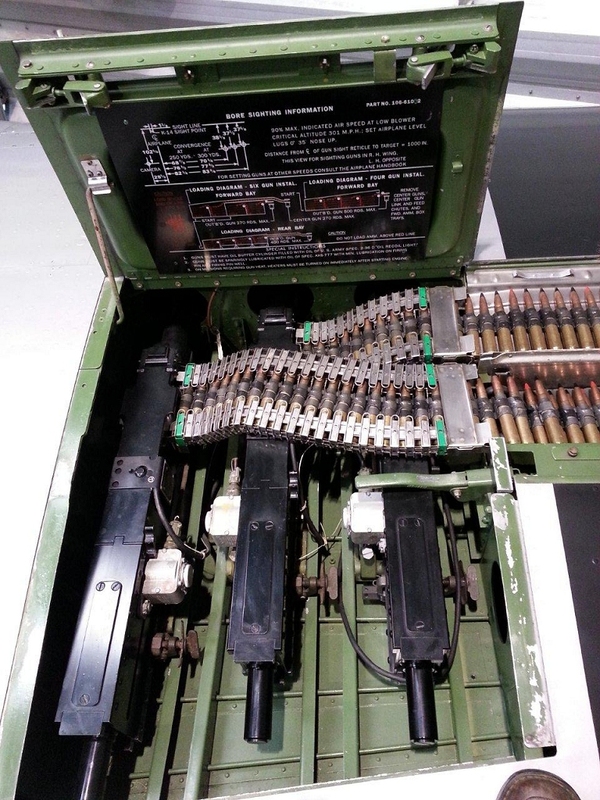 These include re-fitting the highly complex K14B gun sight, which was the state of the art item towards the end of WW2, with the throttle actually linked to the gun sight. Yes it’s a big old lump, takes up a significant proportion of the windscreen but it looks so nice and deserves to be in pride of place at the sharp end. By Xmas we hope she will be fully complete but I have uploaded a few shots to wet your appetite. As I mentioned in the past, an aircraft as close to the factory fresh build specification up in 1944 as you will ever find. PL965 our wonderful MK XI Spitfire was last flown on Saturday 20th October. It was one of those foggy mornings that slowly cleared into a sunny and clear afternoon and I had the great pleasure and deep privilege to fly her to Wellesbourne and then back to Weald via Turweston. You know how sometimes you get a song into your head and it won’t go away … well there I was flying wonderful aerobatics north of Aylesbury, loops and half Cubans and barrel rolls whilst singing out loud “ I remember yooooo” by Frank Ifield, wonderful moments. She has enjoyed a very busy season with displays at many of the key shows, to include Bournemouth, Southport and so many more. To remind you,PL 965 is THE only Spitfire still flying on her original wartime service engine and is a really significant wartime survivor with 45 missions with RAF 16 Squadron in 1944/1945, a time-warp aircraft and world’s only flying MK XI. She will be seen flying all over the southern UK during the winter, as earlier mentioned nothing better than to fly these old ladies as much as you are able, weather permitting. 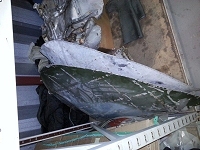 Now onto PT 879, our Russian survivor MK IX Spitfire from 1944. She is coming one really well. I forget but did I tell you that there are some Spitfires rebuilt these days from a chassis plate and no more than the contents of a Tesco carrier bag! Well PT 879 is the opposite of the scale as we have a complete aircraft that returned from Russia in the early 1990’s, fills a 20 foot container. 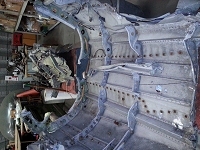 Wings, fuselage, engine, hub, many thousands of parts that will be incorporated into her restoration. When she emerges in years to come, she will be the first Spitfire to return from Russia out of the many, many Spits and Hurricanes that went to the eastern front as part of 'Lend Lease' She will be so special and a fantastic addition to the Hangar 11 Collection. 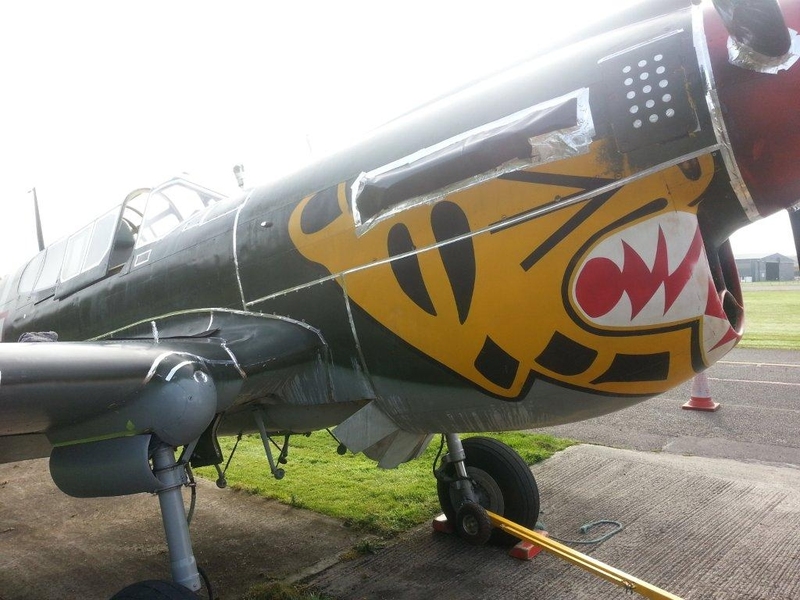 So, to close, after a busy season flying, now the hard winter work commences but every year we undertake a major project and this winter it is our P40 that will emerge in her new colour scheme in the spring. Thanks for reading this news update, hope you enjoyed it. I have to apologise for the very long break since our last news article. Fact is that between work ( day job) flying and a very sick mother, life has been a bit hectic all round, so sorry for that. However lots to tell you now that we have reached what I guess must be termed as “mid summer”. Clearly flying activities at Hangar 11 have been adversely affected by the wettest spring & summer on record, a period where we lost a hefty number of displays due to the awful weather. Several events were cancelled because sites were completely waterlogged. In spite of this, the collection and its chief pilot are in very fine fettle indeed, so read on. 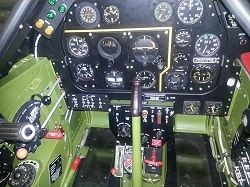 The big winter 2011/2012 project was the complete restoration our P51D Mustang cockpit to restore her to former glory. This has been a long term labour of great skill and loving attention to detail by our Chief Engineer and mechanical genius Chris Norris and his team. What has emerged is a wonderful living museum, just fabulous. 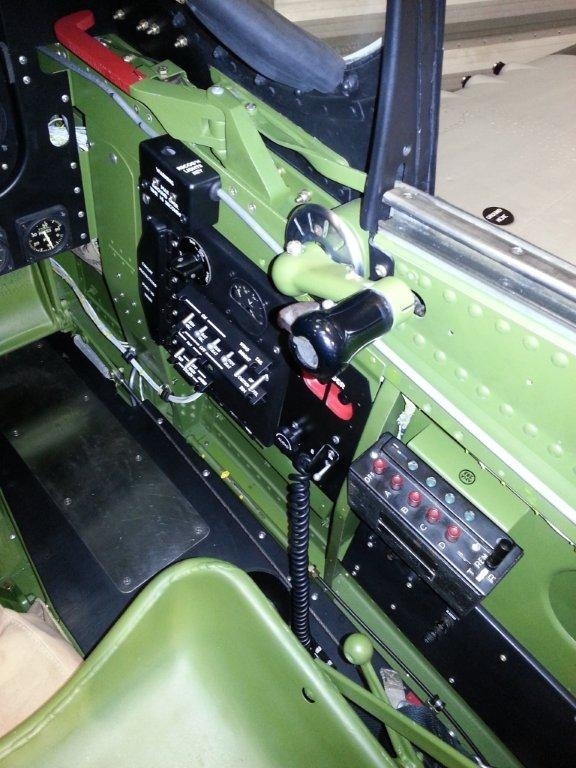 Gone are any 1960/70’s modifications of the avionics and instrumentation, these being replaced by all the original switches, instruments, canvas covers, placards, wiring all wrapped with the right hand tied rope and so much more. Now “Jumpin Jacques” is in exactly the same condition as she left the North American factory at Inglewood California in summer 1944. All mechanical items in the cockpit area have been stripped, completely overhauled, re-painted and re-fitted, looking better than new. 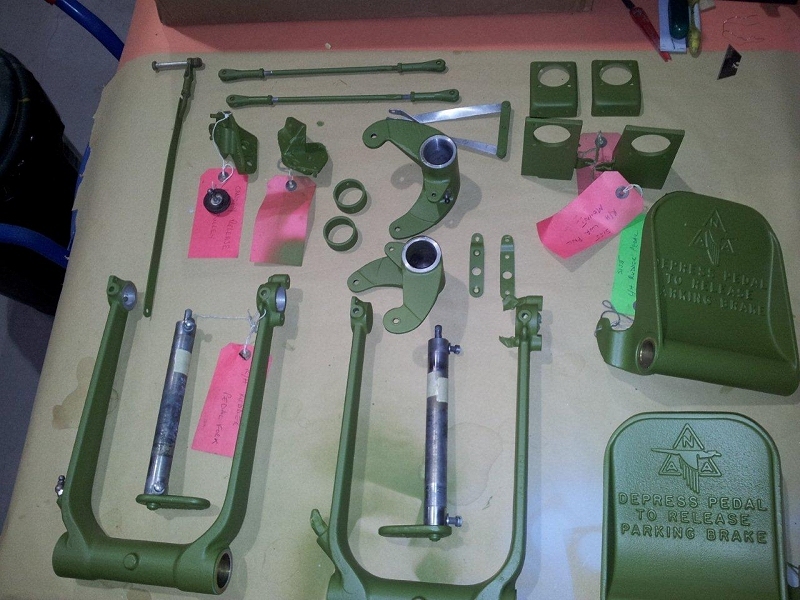 These include, to name but a few, rudder pedal assembly, brake master cylinders, control column, entire fresh air system and floor, pilot seat and passenger seat, canopy winding mechanism, the list is endless. I have masses of photos and these will be added to the site as soon as I get a moment but flat out flying right now, is this is busiest time of the season for us. Jumpin Jacques was issued a new permit on 14th July and flew her CAA tri annual test flight on 11th July. She has since completed a long distance mission to Sunderland Airshow, where she displayed with great distinction and then goes to Edinburgh for the East Fortune Airshow last weekend of July. She is such a rare and historic WW2 survivor and has to be one of the most historic and original P51 Mustangs anywhere in the world and is of course a veteran of the 332 nd Fighter Group in Italy, the “Tuskegee Airmen”. Our Hurribomber returned to the skies on the 8th of May in readiness for a busy season of flying. Her first commitment was a corporate display which we managed to fly in spite of the weather and she is in great form. 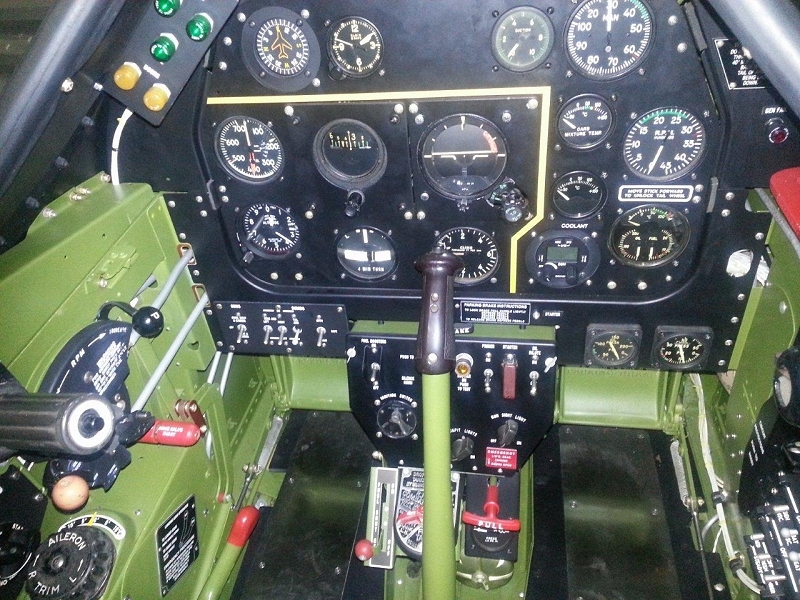 One thing we managed to do over the winter was to sort out a fresh air supply into the cockpit, as I have to tell you that a Hurricane is no less than a flying sauna in the summer. 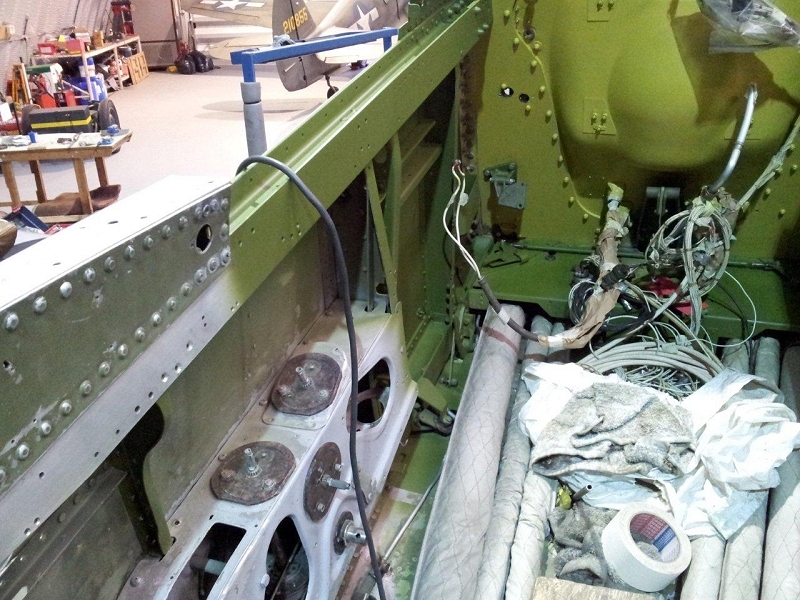 This is due to the fact that unlike say our spitfire, which has her radiators under the wings, or in the case of the Mustang below and rear of the fuselage, good old Sydney Camm decided to place the hot bit right under the driver’s seat!. Plus there is no cockpit floor ( do not drop your pen, I speak from experience) so all the coolant pipes run right under your feet. Add that to a pretty warm Merlin engine upfront and my word she gets blummin hot ! Anyway, we found the wartime photos of BE505 and she had 2 neat little scoops each side of the windscreen and these were replicated and they make a good difference. Temps are probably down to just 100 degrees rather than 120 degrees! She is such a regal old lady, a pleasure to fly and will out manoeuvre a Spitfire any day. 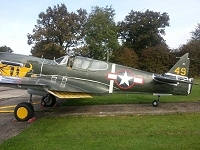 Our Curtiss P40 Kittyhawk finally starred in the film “Red Tails” which went on general release in June this year. Was it a literary masterpiece or visually greater than Ben Hur, well not quite but after Mr Lucas finished with his CGI magic, the 2 Kittyhawks that actually flew on set led by yours truly, became about 40 !. I had myself in multiple, so all very interesting. Great experience and having lunch on set with a Hollywood legend was kinda fun. She was due to have a quiet year, during which the plan was to strip that film paint (amazingly still on there after 3 years) and completely repaint in new scheme but we had a thought that perhaps “JJ” would be delayed in restoration, so better keep the P40 ready to step up and undertake any bookings early on in the season. Good decision as “Kitty” deputised at a number of shows including Southend and Cosford, Yeovilton and others. No organisers were disappointed as she did a great job and is after all a really rare USAF fighter and a very appropriate stand in. G-KITT is now on annual inspection and expected to be back in the air to fly her many commitments later in the year, to include the big “Wings and Wheels” show at Dunsfold, bank holiday weekend in August as well as Little Gransden, Southport Airshow and several others. We will paint her this winter promise! That leaves our wonderful Mk XI Spitfire PL 965. 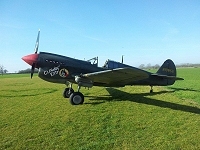 Well, she has been busy all season, ever since first display at the opening of the Sywell Museum, first week of April. Her annual inspection was completed in such a way that she had a clear run all season and that original Rolls Royce Merlin 70 is purring along nicely. Remember she is the only Spitfire in the world, flying on her original wartime service engine ( had I told you that before ). PL965 will be undertaking some really lovely displays this year, some overseas and others that include the huge seaside show at Bournemouth as well as classic concerts at iconic venues such as Warwick Castle, Ripley Castle and Leeds castle. They say that when you fly a Spitfire you become part of the aircraft, man and machine as one, just read Geoffrey Wellum and others in wartime stories and books. You know I am going to be really boring and say I absolutely agree. I have been flying “Spits” for almost 10 years and you know when I am displaying PL 965 , how can I explain, I enter such a relaxed and calm state, almost Zen like when I am totally at one with the plane, it’s a wonderful fusion, what a deep privilege it is to be able to experience that. The Airshow world has of course been affected by the tough economy and a number of well known airshows have been lost as a result. That has put pressure on all operators of warbirds to find other work but gratefully we have a very wide client base of private and corporate clients as well as regular airshow clients, so we are pretty busy. June and July saw displays at several major airshows by Hangar 11 Collection aircraft, these included: RAF Odiham, RAF Cosford, RNAS Yeovilton, Hucknall, East Fortune, Sunderland and more. July will be really busy too with Hangar 11 aircraft displaying at several major shows to include: Eastbourne, Bournemouth, Shoreham, Oxford, Dunsfold, Sywell, Lt Gransden and others. One venue is notably missing so far and that is a real favourite of mine. Old Warden the Shuttleworth Collection, has suffered more than most from weather related cancellations in 2012. In fact they lost their big shows in May and June and then so sadly cancelled the show on 1st July due to the tragic death of a good mate. Trevor Roche was killed in an accident that day. He was a super bloke and a brilliant pilot. I showed my own respects to Trevor by flying a Spitfire display at his funeral gathering near Salisbury earlier this month. I felt it was a fitting and proper way to salute a fellow flyer and all round lovely guy. Trevor will be sadly missed by all that knew him and my deep condolences go out to his wife Katie and daughters Amalie and Karina. To close, I am delighted to report that good progress is being made on the restoration of our unique MK IX Spitfire PT 879. 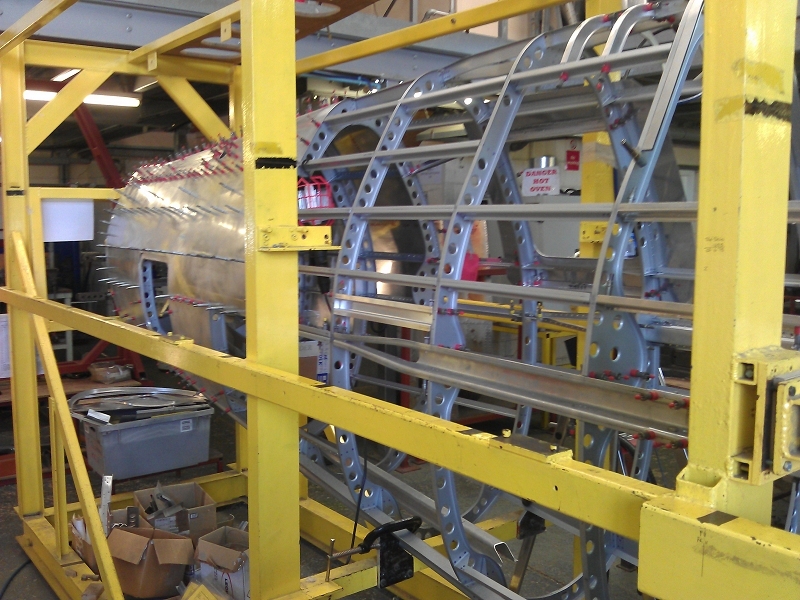 The fuselage will be ready for fitting out early in 2013 and we expect wings to be started shortly. She will be the first Spitfire returning from Russia, where she crashed in January 1945 with a mere 28 hours on the clock. Watch this site for pictures more news. Hangar 11 continues to be a hive of activity as we prepare for the flying season and complete the cockpit restoration of our P51 Mustang “Jumpin Jacques”. 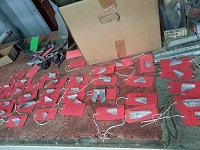 As always these tasks take far longer than had been anticipated, as the original brief grows and as more components are removed for inspection and repaint. 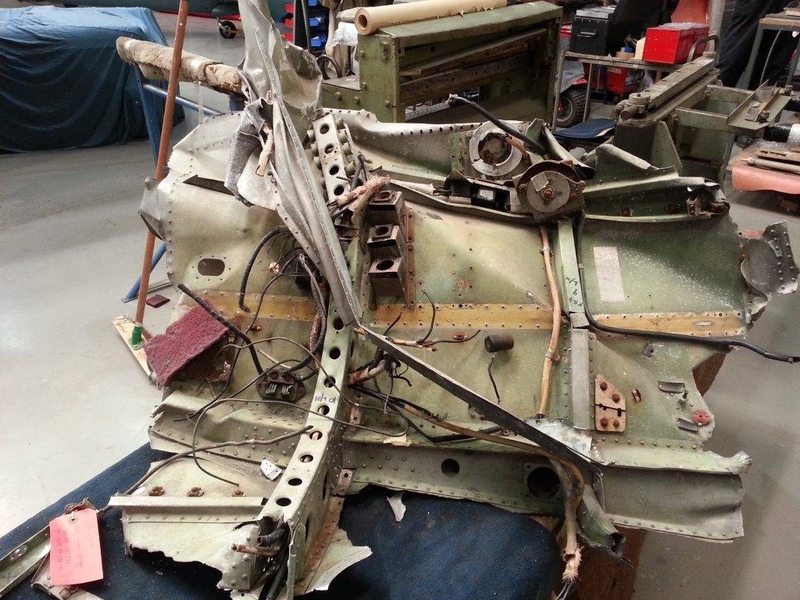 The “well we may as well do that while it is out” syndrome takes over and the timescales move out as we expose parts of this fabulous original aircraft that have not been attended to in almost 70 years. Chris our Chief Engineer has had sleepless nights as he manages this complex process. However, we have the benefit of his great skills and he leads a team of talented guys who bring so much to this very meaningful endeavour. 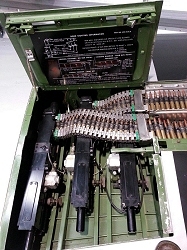 For instance the control column is connected via control rods to the ailerons and the elevator and all these mechanisms are housed in a tunnel on the cockpit floor. A series of complex bearings and couplings are hidden under the floorboards and these had not seen the light of day since 1944. We decided to remove, inspect, service and repaint and this is an example of how the project grew. 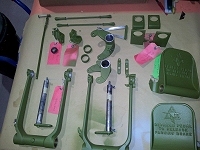 The rudder pedals sit on a special cross tube that also houses the brake master cylinders and again, none of these assemblies has been out of the aircraft since 1944. Those beautiful chunky rudder pedals, each emblazoned with the “North American” logo, show the signs of wear over so many years, starting with her service in the USAF 332nd Fighter Group the Tuskegee airmen in Italy during 1944/1945. The pedals had lost all their green paint but as can now be seen from the attached photos, they are once again resplendent in fresh green paint of the correct tonality. You will see from some of the photos attached, that we have stripped out every part from the firewall right back to the back of the cockpit. It’s just amazing to expose this virtually untouched area and discover all the original features, paint and decals that have survived 70 years looking like the day they left the North American factory at Inglewood in the summer of 1944. You may recall that the first owner was the US government from 1944 through to 1957 and then a private owner Whiteman Enterprises in California right through to the 1980’s, after a spell in France and then to the Hangar 11 Collection in 2001. 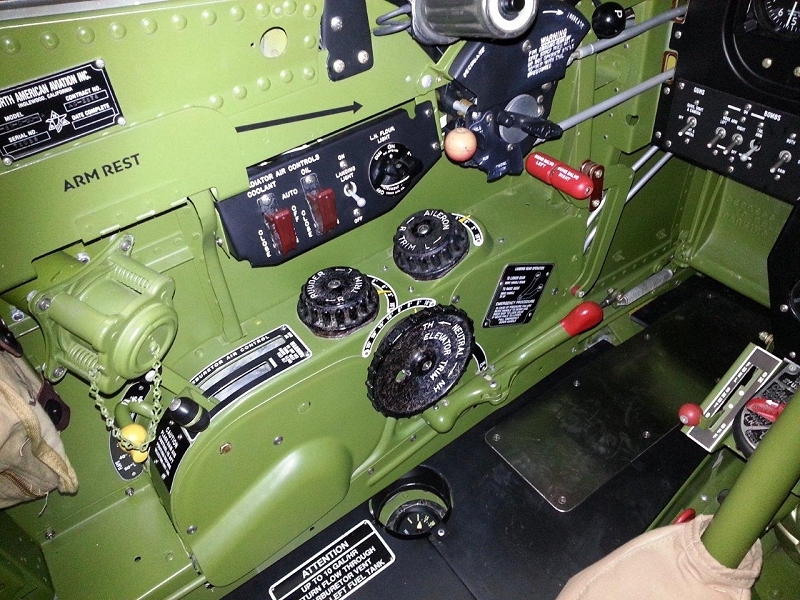 During that time, inevitably, some parts have been removed and some replaced with more modern kit and this refers in particular to radios and navigation equipment which clearly have evolved over the years. 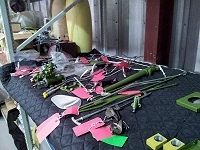 However our task is now to remove any of these items and replace the original factory fitted items. The great thing is that the fuselage acts as a template and all the original holes and brackets are still there, which makes our task so much easier. Even the witness marks are clearly visible, so as we offer up period parts we see exactly where they fit. A huge factor in restoration of a Mustang as opposed to say the spitfire is the quality of original drawings, manuals and plans. The good old British, used armies of draftsmen, who produced millions of superb detailed drawings and some of these survived and are housed at such venues as the RAF Museum and the National archive but equally many were destroyed, lost or simply chucked out! On the other hand, the good old yanks did a fabulous job , insisting that any manufacturer contracted the US Government had to place all plans and manuals on microfilm. That has meant that we have around 20,000 detailed drawings of the P51 Mustang ( all on a couple of CD’s ) along with every conceivable detail, material specs measurements and so on. This allows us to faithfully replace all missing items and we hope that when the project is completed in May, that “Jumpin Jacques” will be arguably the most original and accurate aircraft of it’s type anywhere in the world. Remember, she has never undergone a full restoration, never been apart, flying on her original fuselage longerons ( the heart of the fuselage) and been flying continuously since 1944! Away from the Mustang cockpit restoration, we have been flying our P40 Kittyhawk throughout the winter months and many folks will have seen her out and about in the south of England. Still in her “ Red Tails” colour scheme after her involvement in the filming of the movie in the Czech Republic in 2009. The film had its premier in Hollywood last month and is expected to be released in the UK shortly. The film has been very well received and tells the story of the Tuskegee airmen who fought so bravely in Italy during the last years of WW2. “Little Kitty” has will now be rested pending her Annual inspection and will re-appear later in the year. That means that we will re-launch our unique MK XI Spitfire this week and she undertook a successful ground last week. After almost 5 months lay off, her original Rolls Royce Merlin 70 burst into life on the first turn of the key and all functions are perfect. We hope that she will return to the skies to undertake early season display commitments over the next few weeks. It will be great to have her back in the air. The Hurribomber is in good shape and we expect her to be flying in April as she has many airshow commitments this season as she is such a popular choice for airshow organisers and crowd alike. G HHII / BE505 is the only remaining example of the iconic “Hurribomber” MK11B . As such, she will be a regular sight at airshows and events all over the UK and selected events around Europe too. 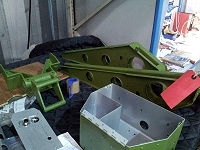 We are also pleased to announce that the restoration of PT 879 is ongoing and we are expecting good progress this year. For those who are not aware of our second Supermarine Spitfire, well...... we do have one! She has really unique history but briefly a MK IX that left Castle Bromwich in autumn 1944 and went to Russia as part of the “lend lease” arrangement and joined a Russian Spitfire Squadron. With only 28 hours total time, sadly she crashed in January 1945. A very clever Capitalist /Communist farmer recovered her to his farm and she was stored for generations close to the crash site. Recovered to the UK in the late 1980’s by Spitfire Guru Peter Monk, she has been carefully stored since and was purchased by the Hangar 11 Collection in 2001. The unique thing about PT 879 is the fact that she is one of only 2 Spitfires that have returned from Russia in any form, in spite of the fact that hundreds of aircraft went east as part of Lend Lease. In addition, in these times when aircraft are restored from little more than a data plate and some original parts, sometimes so few that they could fit into a Tesco carrier bag. However with PT 879 here we have an almost complete aircraft and we have recovered post a crash, large sections of the fuselage and wings, together with the Rolls Royce Merlin 66 engine, prop hub with remains of wooden blades in place, tanks and panels plus masses of the system parts. 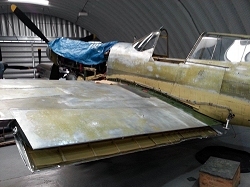 Once restored, she will be the very first Spitfire returning from Russia plus arguably one of the most original restorations of a Spitfire as she will contain such a depth of original parts, so watch this space for initial photos and progress reports. To close, we are asked weekly to publish our airshow display dates but to date we have not done that due to the fluent and evolving nature of the airshow world. As soon as we have a firm schedule we will place details on the website. 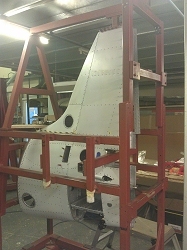 The period since Xmas has been busy at Hangar 11 as we continue to work hard on the Mustang cockpit and other winter tasks. Jumpin Jacques is such an original old girl, she has never been restored since her service with the 332nd Fighter Group in Europe in 1944/45. So we decided it was high time to take some of the key components out of the cockpit floor for inspection. 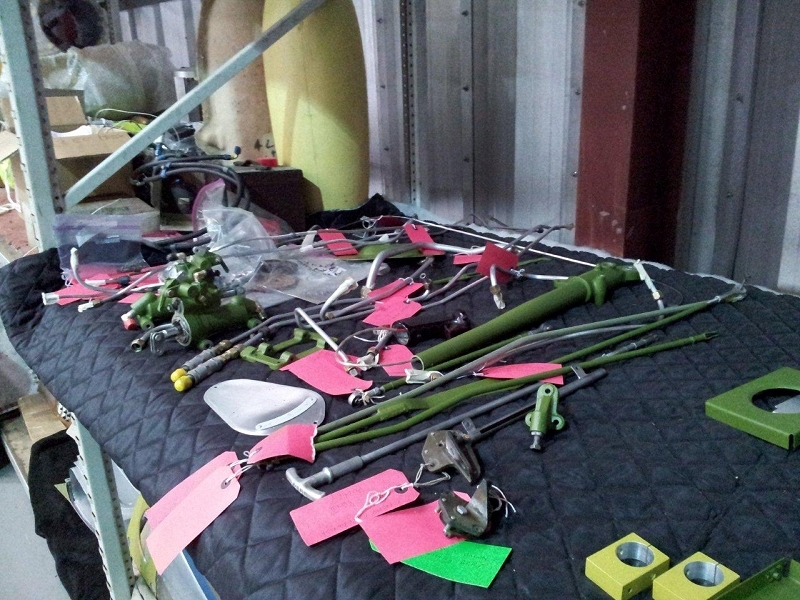 Such items as the rudder pedals, main control shaft and many of the rods and levers that disappear into the floor, sight unseen. These components were removed for the first time in 68 years and it’s really fascinating to see original items which have been undisturbed over all these years coming out and in such excellent condition in most cases. Where there has been wear in bushes or bearings, these have been replaced or overhauled. Brake master cylinders had new seals fitted and so on. Also satisfying is to see the original paint on the firewall, longerons and on most of the cockpit area still in great condition from the factory in 1944. So we decide to just touch in any areas that are worn but most, after a clean off with fuel, look like new. 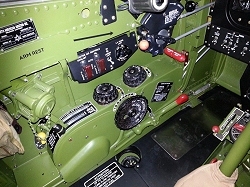 Any modern bits of “kit”, added since the 1940’s have been consigned to the dustbin and we are re-installing any items in the dash that have been removed. Last week we sourced the remote compass indicator, which came in a sealed box dated 1943, it seems sacrilegious to break the tape after70 years ! So, progress is slow but very positive and Chris and his team are doing a brilliant job and “Jumpin Jacques” is expected back in the skies within next 3 months, well in time for the busy season ahead. 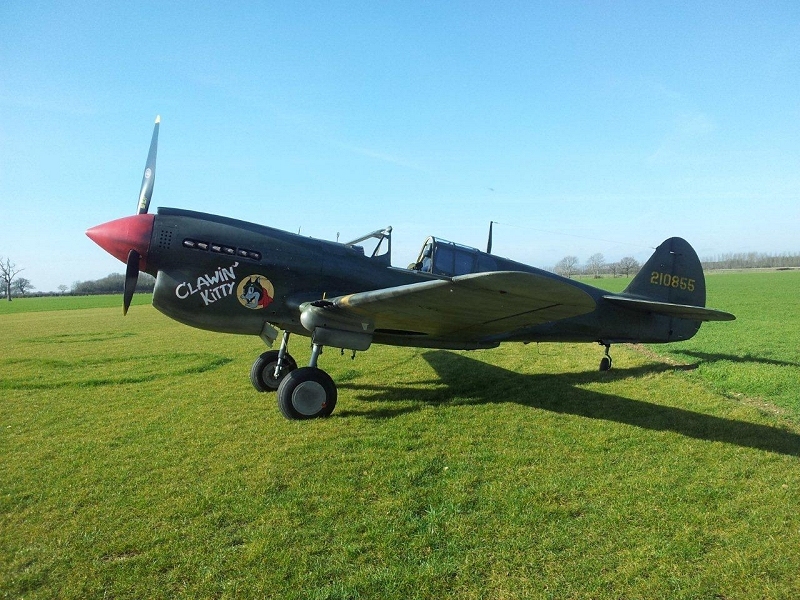 I flew our P40 Kittyhawk last week and some of these bright winter days present perfect flying conditions. The cold crisp air allows the engine to work so much more efficiently and it is a great privilege to fly these warbirds during the winter months. We are pretty much the only operator flying these aircraft at this time of year. We had a new addition to the hangar last weekend, a super Mercury tractor unit from the second WW period. This was used to tow bombs on RAF stations and indeed on aircraft carriers as well. Bomb loads up to 20 tonnes were regular fare and she will be use to tow our British fighters around the hangar and ramp. Our new website has been widely praised and I am very pleased with it as a platform to expand from. We have literally thousands of great photos in our library, yet at present we have just a few representative examples on the site. We are remedying that right now and expect far more on the site very soon. Also, been a lot of positive comment and feedback about our video section and in particular the first clip which is the “in cockpit” sequence from my opening of the show at Dunsfold last year in the Spitfire. I was asked why I rotated my head left and right on the initial pull up….no it’s not a nervous twitch !! Fact is that I am looking for the angle at which the wing tips cut the horizon to be equal on both sides, so if I see the same picture port and starboard, I know the pull is perfectly straight and that we will reach the inverted dead level. This is so important when you are working to a fine display line and need to know that you are bang on that line around the whole loop or other vertical manoeuvre. So that is the latest from the Hangar 11 Collection for now. We have been asked several times for display dates for the 2012 season, there are many already in our diary but these will be posted on the site in months to come. Many thanks to all the Hangar volunteers for your essential contribution and to Chris for making it all come together. December 31, 2011 - New Year - New look!. We are delighted that you are looking at our new website that was launched on December 30th, to see in the New Year. We have a new and dynamic webmaster Tim Callaway, well known within the flying fraternity who will hopefully whip me into shape and make sure that we keep news and photos up to date! Looking back at 2011 it was a really busy year for the Hangar 11 Collection, in fact a record year in terms of number of flights and displays flown. Starting at the end of April at Sywell in our Hurribomber and running right through to 2nd October at Old Warden in our P51 Mustang, we flew almost every weekend and on many occasions in the week too and clocked up 85 public displays in 5 countries, so all in all a great result. Furthest missions were to southern Germany and northern Holland. Hangar 11 Collection is one of Europe's busiest operators of WW2 aircraft and in between the many public displays we also carried out some documentary work for the BBC, flying in the excellent programme called “ Operation Crossbow” all about the amazing work of the photo reconnaissance squadrons, which mapped occupied Europe during those dark years of 1939-1945. Amongst other duties they photographed the results of bomber raids, kept close surveillance on enemy shipping and troop movements as well as the preparation for D Day landings in 1944. It was astonishing to discover that so many thousands of people were closely involved with these covert operations. Try to watch the documentary if you can, well worth it. In terms of the Hangar 11 Collection aircraft all largely went well this year and apart from a few weather driven issues, we did not fail to appear as per our schedule nor let our audiences down. 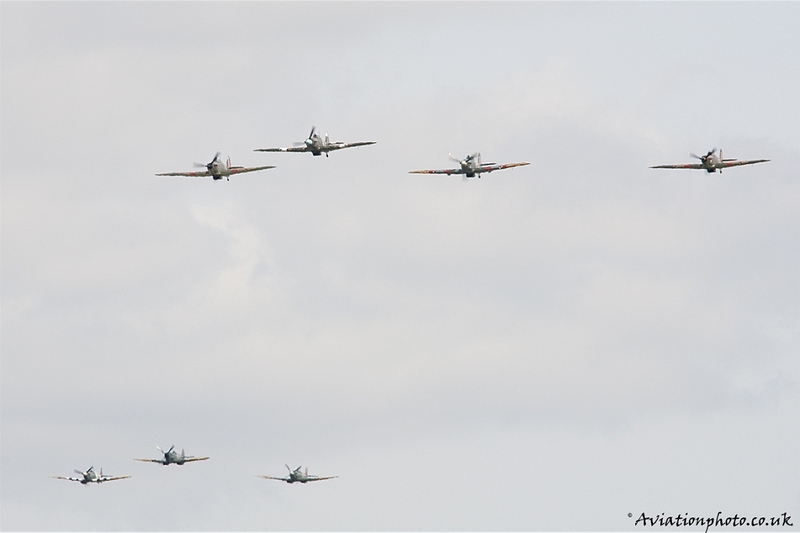 All 4 fighters flew extensively during 2011, although the P40 Kittyhawk more towards the later part of the season. Our unique MK XI Spitfire PL 965 has now covered some 35 hours on her original wartime service engine and remains as far as we are aware the only Spitfire in the world operating on its original power plant ( with which she flew some 25 missions). A very special aircraft which has given so much joy to so many in her new colour scheme, which is exactly as she served in RAF 16 Squadron in Belgium between October 1944 and the end of the hostilities. Please do take a look at the new photos of her in the images section. “Jumpin Jacques” our fabulous P51 Mustang covered a number of long distance missions to Germany, Holland and Ireland this year. She is a “long legged” old lady just 68 years young, she still has amazing long distance ability, with standard fuel tankage still offering a range of pretty much 1,000 miles at 250 mph at a moderate power setting which represents perhaps 40% power from her 27 litre Merlin engine. Our Hurribomber BE 505 “ Pegs” also had a very busy season and was seen by several hundred thousand people between her fist display in April through a busy season. I hope that most would agree, her graceful aerobatic displays are pretty unique. In my humble opinion, the Hurricane is in many ways as good as the Spitfire and perhaps better. If I had to go to war tomorrow, I would probably take a Hurricane as it will out manoeuvre almost any other fighter I can think of. Let’s hope that our exposure of this fine aircraft, displaying her true capabilities, will enhance the Hurricane’s reputation as an equal to the Spitfire marques of the early war years. Looking ahead to 2012 Hangar 11 is a hive of activity right now. 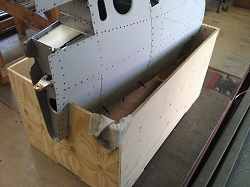 Each year we have a winter project and this year we are working on the cockpit section of the Mustang. She is such an original aircraft not having been restored over these last 68 years and still flies on her original longerons. 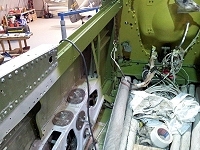 As such we decided it was high time to take the floor boards up, inspect the pedal assemblies and so much more that has been untouched over the decades since she served with such distinction in the Italian theatre of war, with the 332nd Fighter Group the “Tuskegee Airmen” in 1944/1945. We are delighted with the results to date and we expect “ Jumpin Jacques” to return to service by April 2012 looking even better than when she left North American Aviation's factory at Inglewood California in the summer of 1944. General ongoing servicing and improvement of the rest of the collection is also taking place over the winter, along with making sure that the other vehicles that are in daily use are maintained, such as our 1950’s grey Ferguson tractor , 1942 Ford Jeep and 1941 Harley Davidson 600 WLA. 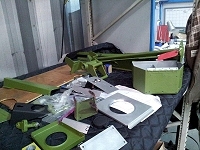 Yes Hangar 11 collection is very busy year round. We are also starting to compile our 2012 airshow diary but with this tough economy, it is hard for everyone but hey...that is what we said this time last year and we had a record one! May I end by wishing all our friends and staff, volunteers and helpers a Happy and Healthy New Year and we look forward to flying with you in the new season.